The first Fender Stratocaster set alight on stage by Jimi Hendrix has been sold at auction for $575,000 (£280,000). Hendrix torched the 1965 Fender Stratocaster at the end of his show at the Astoria in Finsbury Park, London, in March 1967. The guitar had expected to sell for more. Prior to the auction, Ted Owen of auctioneers The Fame Bureau said: "We can only find evidence of Hendrix definitively burning two guitars. And because this piece is a one-off original, I feel that this is the most important Hendrix guitar ever to be offered for sale - even eclipsing the Woodstock Stratocaster which eventually sold for $1.8 million." Not so. 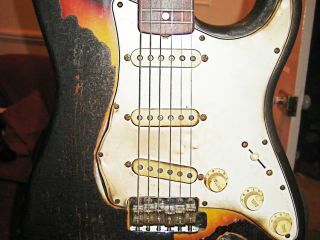 Indeed, the torched Strat's buyer, American collector Daniel Boucher, said: "I thought I'd have to pay a little bit more for it, actually. "I am going to play it, I hope some of it rubs off on me."